Glaucoma is a disease of the eye that causes damage to the optic nerve. If left untreated, the disease can destroy the optic nerve, leading to loss of vision. Severe glaucoma without treatment can result in blindness.. Glaucoma usually involves the buildup of excessive fluid pressure within the eye. Most people who have glaucoma are above the age of 65, although glaucoma can occur at any age. If other people in the family have glaucoma, the risk of developing glaucoma increases. A thorough eye examination is necessary to diagnose glaucoma. Glaucoma is usually painless and the vision changes are difficult to detect in early cases. 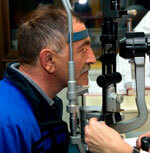 Close monitoring of the eye is necessary to prevent glaucoma vision damage. With proper medical care, glaucoma may be treated and controlled. An eye examination for glaucoma, including specialized testing, is the most important tool in preventing vision loss. During your exam, your doctors may determine that the Heidelberg Retinal Tomography test (HRT) and/or automated visual field testing is needed. The Heidelberg Retinal Tomography is a system that combines a laser-scanning camera and specialized software that evaluates the optic nerve. The HRT may diagnose glaucoma years before symptoms become apparent to the patient. The HRT is especially useful at detecting small changes over time. Glaucoma usually affects peripheral vision (side vision) before it damages central (reading) vision. Proper glaucoma care involves periodic analysis of the peripheral vision. At Eye Physicians, we employ the Zeiss/Humphrey visual field analyzer, which is faster and more accurate than previous tests. Treatment of glaucoma can generally prevent the loss of vision. Eye drops or even medications by mouth can reduce fluid pressure within the eye. 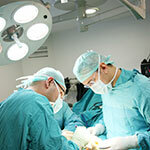 Glaucoma laser surgery may be recommended for glaucoma treatment. Laser surgery options include: laser trabeculoplasty, which is used for treating the common form of glaucoma, and laser iridotomy, which is used to treat narrow angle glaucoma. Age-related macular degeneration (AMD) is the most frequent cause of vision loss among people 50 years and older If patients with certain types of AMD are to benefit from recent developments in treatment, it is important that the condition be diagnosed as early as possible. AMD can be classified as either non-neovascular (dry) or neovascular (wet). Dry AMD is characterized by drusen and changes in the pigmented layer of the retina. Wet AMD will have fluid and/or blood in the macular area of the retina. Most patients with severe vision loss from AMD have the neovascular (wet) form. Neovascular AMD is characterized by abnormal new blood vessels growing underneath the retina. The main symptoms of neovascular AMD are blurred vision, blind spots, and distortion of vision. No treatment will reduce the risk of developing non-neovascular AMD and there is no treatment that can reverse the condition. The Age-Related Eye Disease Study (AREDS) has shown that some patients with dry AMD may benefit from supplementation with antioxidants: vitamin C 500 mg, vitamin E 400 IU, and beta carotene 15 mg and zinc (80 mg) and copper (2 mg) as cupric oxide (copper should be taken with zinc, because high-dose zinc is associated with copper deficiency). The AREDS 2 study looked at substituting lutein zeaxanthine for beta-carotene, and found a further decreased risk of advanced AMD. Until recently the only available treatment to seal these leaking vessels was with a laser. The earliest treatment was Laser Photocoagulation. This was followed by Photodynamic Therapy (PDT) (a drug injected intravenously and used to help direct the laser to the affected area) and was not suitable for all types of lesions. The blood vessels may again begin to leak and further treatment may be required. The laser treatment itself may cause scarring. Researchers and physicians have looked for a follow -up to this treatment that might maintain vision for a longer period of time without repeated laser use. They are looking for new therapies which would be effective for all types of wet AMD. One lone of thought stems from cancer research and the causes of angiogenesis-the growth of new blood vessels. It was discovered that there is a protein in the eye which encourages the development of blood vessels called "vascular endothelial growth factor " (VEGF) and drugs are being developed to inhibit VEGF by trapping it or preventing it from binding with elements which will stimulate growth. How Can the Patient Treat AMD? Antioxidant vitamin preparations are commercially available without a doctors prescription. Two excellent supplements on the market are Ocuvite-PreserVision (2 tablets twice a day) and Alcon ICaps (2 tablets twice a day). Other similar preparations are also available. Researchers from Harvard University found that people who eat the most lutein-rich foods are 43% less likely to develop AMD. People most protected from age-related macular degeneration eat 5 or more helpings of spinach or collard greens per week. Each helping should be at least 1/2 cup cooked or raw. Another benefit of a diet rich in vegetables is a decreased risk of cancer and cardiovascular disease. To help provide timely service to our patients, we prefer to schedule all visits. If you are unable to keep an appointment, we ask that you kindly provide us with at least 48 hours' notice. This courtesy on your part will make it possible to give your appointment to another patient. © 2019 Jensen Eye Associates and MedNet Technologies, Inc. All Rights Reserved.